WASHINGTON – A music promoter who promised Donald Trump Jr. over email that a Russian lawyer would provide dirt about Hillary Clinton in June 2016 made the offer because he had been assured the Moscow attorney was "well connected" and had "damaging material," the promoter testified to the Senate Judiciary Committee. Rob Goldstone told the committee that his client, the Russian pop star and developer Emin Agalarov, had insisted he help set up the meeting between President Donald Trump's son and the lawyer during the campaign to pass along material on Clinton, overriding Goldstone's own warnings that the meeting would be a bad idea. "He said, 'it doesn't matter. You just have to get the meeting," Goldstone, a British citizen, testified. The intensity with which Agalorov and his father, the billionaire Aras Agalarov, sought the Trump Tower meeting, which has become a key point of scrutiny for congressional inquiries and special counsel Robert S. Mueller, was revealed in more than 2,500 pages of congressional testimony and exhibits that were released by the Senate Judiciary Committee Wednesday morning. Committee Democrats circulated some excerpts from the testimony in advance of their formal release at 9 a.m. The excerpted testimony shows that attendees at the June 9, 2016, Trump Tower meeting largely agreed with Trump Jr.'s long-standing contention that the lawyer, Natalia Veselnitskaya, did not transmit dirt about Clinton. She has denied she was acting on behalf of the Russian government. But the new information helps explain why Goldstone had written the candidate's son before the meeting that Veselnitskaya would bring "very high level and sensitive information" that was part of "Russia and its government's support for Mr. Trump" – and why Trump Jr. responded, "if it is what you say, then I love it." The excerpts also shed light on the anxiety that rippled through President Trump's orbit a year later, as news of the meeting became public and his aides and lawyers tried to manage the story. The testimony also includes new details about Trump's long interest in building business ties to Russia and a relationship with President Vladimir Putin. An Agalarov employee testified to the committee that the Russian mogul tried to get Trump a meeting with Putin when the Miss Universe pageant, which Trump owned, was held in Moscow in 2013. The employee told the committee that Agalarov "secretly requested" the meeting through a Russian government official. Putin agreed to attend a pageant rehearsal, but canceled at the last minute. Though Trump periodically claimed during the campaign that he knew Putin, there is no evidence the two men met until after Trump took office. Much of the testimony released Wednesday revolves around the Trump Tower meeting when Trump Jr. accepted the sit-down with Veselnitskaya and invited his brother-in-law Jared Kushner and top campaign aide Paul Manafort to attend as well. Goldstone testified that he, like Trump Jr., attended the meeting expecting Veselnitskaya would deliver a "smoking gun" to help Trump's campaign. He testified that he was embarrassed and apologetic when she instead used the session to press her view that the sanctions imposed on Russia for human rights abuses, known as the Magnitsky Act, should be lifted. The president's son acknowledged he too was disappointed that the Russian lawyer did not provide more information that could be used in the campaign: "All else being equal, I wouldn't have wanted to waste 20 minutes hearing about something that I wasn't supposed to be meeting about," he told the committee. Though panel Republicans conferred with their Democratic counterparts on point-by-point issues during the preparation of the transcripts, their release is expected to touch off a new wave of partisan bickering. Months have gone by since committee chairman Republican Sen. Charles R. Grassley, R-Iowa, first promised that the committee would release transcripts of the interviews committee conducted with some of the participants in the Trump Tower meeting. Veselnitskaya only agreed to provide written answers from Russia to the panel's questions. Neither Kushner, now a top White House aide, nor Manafort, who has been charged with a series of financial crimes related to his work before joining the campaign, sat for interviews. But the committee interviewed the five other men who took part in the session, including a Russian American lobbyist who once served in an Soviet counterintelligence unit. Sen. Dianne Feinstein, D-Calif., has said that she supports the release of the interview transcripts, but panel Democrats contend Republicans did not push witnesses to answer all key questions and are preparing to end their inquiry prematurely. In a statement, committee Democrats said said the Trump Tower meeting was "one piece of a much larger puzzle and confirms that the Trump campaign was willing to accept Russia's assistance." They pressed for their committee's investigation to continue. Across the Capitol, the Russia probes have been winding down. Last month, the Republicans on the House Intelligence Committee released the final report of their year-long investigation of Russian interference in the election and the Kremlin's alleged collusion with the Trump administration, concluding over the protestations of panel Democrats that the Trump campaign did not cooperate with Moscow. The Senate Intelligence Committee, which continues to press ahead with its investigation, is soon expected to release the second of four interim reports, with its final report expected in the fall." President Trump has repeatedly insisted that his campaign did not collude with Russian efforts to interfere in the election, including through the hacking and distribution of Democratic emails. "I appreciate the opportunity to have assisted the Judiciary Committee in its inquiry," Trump Jr., said in a prepared statement. "The public can now see that for over five hours I answered every question asked and was candid and forthright with the Committee." Shortly after his election, President Trump's spokeswoman had said that no campaign officials had dealings with Russians during the campaign. Excerpts from the newly released testimony show that the president's lawyers and associates were anxious about any reports on Trump Jr.'s meeting, which contradicted that claim. "[Trump's lawyers are] concerned because it links Don Jr. to officials from Russia, which he has always denied meeting," Goldstone wrote in an email to Emin Agalarov on June 26, 2017, a few weeks before the New York Times first reported on the meeting. 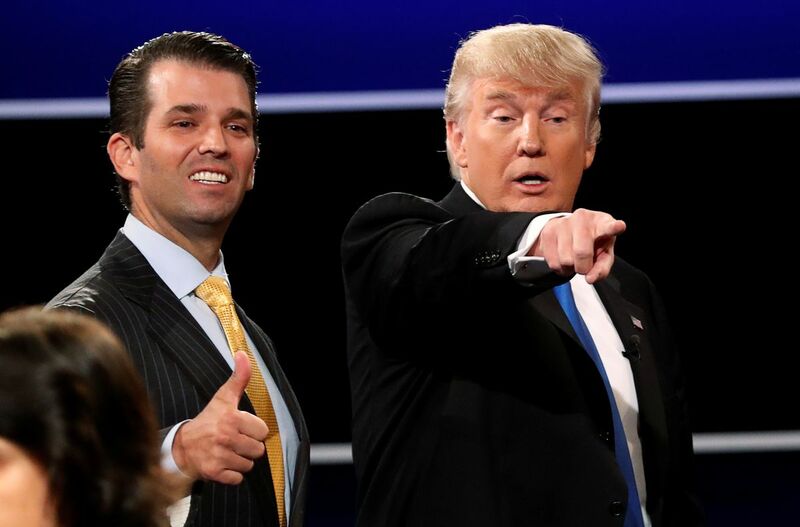 Ultimately, lawyers working for the Trump Organization crafted statements they asked other participants in the meeting to distribute, a move that could draw scrutiny from Mueller if it involved communicating with witnesses or otherwise hiding the true purpose of the meeting from investigators. .
Trump himself contributed to an initial statement about the meeting and released by his son, Trump Jr. told the committee. It misleadingly stated said the meeting had been "primarily" about the adoption of Russian children by Americans. The Kremlin halted adoptions in retaliation for the Magnitsky Act, the policy issue that appeared to be at the heart of Veselnitskaya's presentation. After Goldstone was interviewed by The Washington Post for the first time about his participation in the meeting in July 2017, the promoter tried to assure two Trump organization lawyers that he too had offered a similar account. "I said only that the meeting appeared to have been about adoption issues and was quickly terminated," he wrote in an email at the time. Meanwhile, Goldstone secretly fretted about the scrutiny he predicted would follow. "I hope this favor was worth it for your dad," he wrote to Emin Agalarov. "It could blow up."